Adding response grouping to the CQL dispatcher, on a similar principle as Nagle's algorithm. Introducing the SharedExecutorPool for worker threads on replicas. But wait! Why is write performance so inconsistent in 2.1? Writes are mostly cruising along at over 190k ops/s, but frequently dips as low as 120, so the average only works out to about 180. 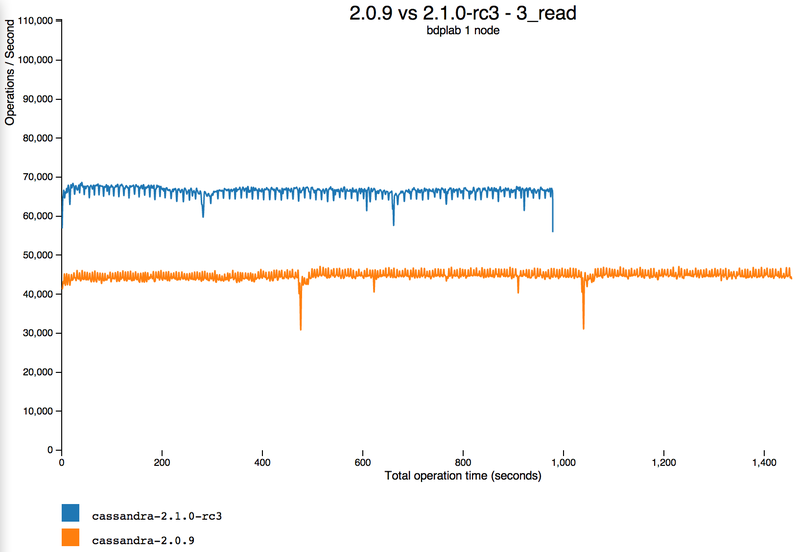 It turns out that after writing a custom in-memory BTree to replace SnapTreeMap and removing the switchlock contention, writes on this 32 core VM are actually bottlenecked on the (single) commitlog disk now. We confirmed this by testing with durable writes disabled, but that's not a very useful scenario for production. So we're prioritizing commitlog compression and support for multiple commitlog volumes quickly. CQL delivering on its promise of a substantial performance boost over Thrift. Even if you only care about performance and not the productivity benefits of CQL, I strongly recommend against Thrift unless you are maintaining a legacy code base. Some environments will benefit more than others from the improvements here. 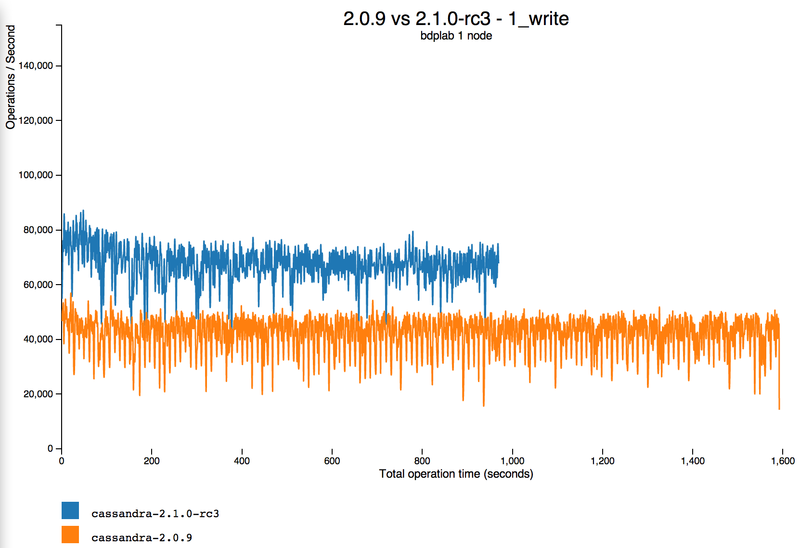 EC2 seems particularly happy with the new executor pool; other hardware may see different gains. Our two year old, 8 core test machines with 6 SATA disks saw "only" a 50% improvement on reads and a 60% improvement on writes. People are sticking with Thrift because CQL is a totally different paradigm. If CQL offered a way to access schema-less Column Families we’d use it in a heartbeat. Sounds like a misunderstanding of what “schema-less column families” actually do. See http://www.datastax.com/dev/blog/does-cql-support-dynamic-columns-wide-rows. That’s not always the case, I’m a beginner regarding cassandra. And I agree CQL is simple, but it hides the daemon, wide rows, queues, etc, that you cannot really understand if you aren’t familiar with the internal ways of cassandra. CQL may work for small data and apps without real latency issues. But the strong point of cassandra and one the main interest over other nosql data store, is it’s ability to scale well. i.e in environment where there’s usually constraint with latency and massive data . do we know when the 2.1 is scheduled for release? just wondering do Cassandra support replication from DB2 or oracle db to Cassandra?… if yes what could be steps or procedure?…IF not then any work around is there? The percentages presented don’t correspond to the chart representations. Is there a source of the benchmark? Thank you.